Julie Chen to be the first visiting artist in the Ettinger Lecture Series. The first presenter in the Ettinger Book Artist Speaker Series (formerly Book FOR[u]Ms) will be the internationally recognized book artist, letterpress printer, structuralist, teacher, and proprietor of Flying Fish Press, Julie Chen. Free Workshop for UWM students and invited guests Wednesday, May 10, 2006, 4-7pm Special Collections Fourth Floor, UWM Libraries These two events are part of a 5-day artist residency in Milwaukee co-sponsored by the UWM Libraries’ Special Collections and Woodland Pattern Book Center, and supported by grants from the Ettinger Family Foundation and the Mary L. Nohl Foundation. Julie Chen will also be offering two workshops and a Master Class at Woodland Pattern, 720 Locust St., Milwaukee (for information, contact Woodland Pattern Book Center at 414.263.5001). 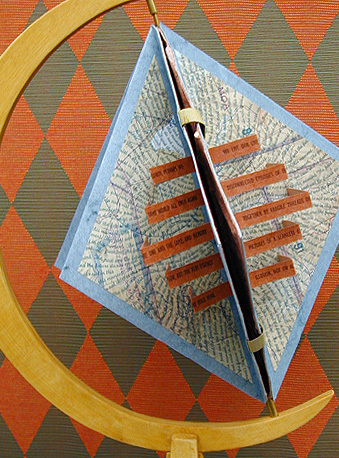 Julie Chen creates and publishes many sculptural, limited-edition artist’s books at her Flying Fish Press in Berkeley, California. She teaches bookmaking workshops around the country and is on the faculty at Mills College where she also received her MA in Book Arts. Flying Fish Press, established by Chen in 1987, is dedicated to the design and production of books that combine the quality and craftsmanship of traditional letterpress printing with the innovation and visual excitement of contemporary non-traditional book structures and modern typography. There is an emphasis on book structures that can function both traditionally as books and sculpturally as objects for display. Editions range in size from 10-150 copies. While Chen is currently focusing solely on the publication of her own artists’ books, the press has had a rich history of producing collaborative projects with other noted visual artists such as Nance O’Banion and Lois Morrison. For further information on the Ettinger Series, please contact Special Collections at 414.229.4345 or libspecial@uwm.edu.